Great new paper in PLOS Genetics documenting epistasis in plants. Efforts to identify loci underlying complex traits generally assume that most genetic variance is additive. Here, we examined the genetics of Arabidopsis thaliana root length and found that the genomic narrow-sense heritability for this trait in the examined population was statistically zero. The low amount of additive genetic variance that could be captured by the genome-wide genotypes likely explains why no associations to root length could be found using standard additive-model-based genome-wide association (GWA) approaches. However, as the broad-sense heritability for root length was significantly larger, and primarily due to epistasis, we also performed an epistatic GWA analysis to map loci contributing to the epistatic genetic variance. Four interacting pairs of loci were revealed, involving seven chromosomal loci that passed a standard multiple-testing corrected significance threshold. The genotype-phenotype maps for these pairs revealed epistasis that cancelled out the additive genetic variance, explaining why these loci were not detected in the additive GWA analysis. Small population sizes, such as in our experiment, increase the risk of identifying false epistatic interactions due to testing for associations with very large numbers of multi-marker genotypes in few phenotyped individuals. Therefore, we estimated the false-positive risk using a new statistical approach that suggested half of the associated pairs to be true positive associations. Our experimental evaluation of candidate genes within the seven associated loci suggests that this estimate is conservative; we identified functional candidate genes that affected root development in four loci that were part of three of the pairs. The statistical epistatic analyses were thus indispensable for confirming known, and identifying new, candidate genes for root length in this population of wild-collected A. thaliana accessions. We also illustrate how epistatic cancellation of the additive genetic variance explains the insignificant narrow-sense and significant broad-sense heritability by using a combination of careful statistical epistatic analyses and functional genetic experiments. Visualization and visual analytics are the future of informatics. We explore here the role of visualization and 3-D printing in biological data mining with application to statistical epistasis networks. We present as a case study a genetic interaction network associated with grey matter density, an endophenotype for late onset Alzheimer's disease, as a physical model constructed with a 3-D printer. The synergy or interaction effects of multiple genetic variants were represented through a color gradient of the physical connections between nodes. 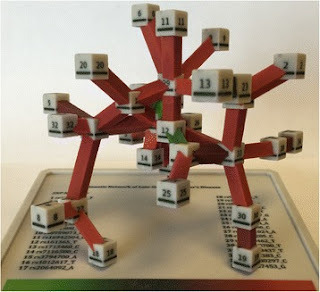 The digital gene-gene interaction network was then 3-D printed to generate a physical network model. The physical 3-D gene-gene interaction network provided an easily manipulated, intuitive and creative way to visualize the synergistic relationships between the genetic variants and grey matter density in patients with late onset Alzheimer's disease. We discuss the advantages and disadvantages of this novel method of biological data mining visualization.